Last winter, we evaluated five different sub-$100 radio remotes in our Bumper Xmas budget flash trigger review. Since then, six months have passed and the market has moved on a step or two. In our earlier test, the Phottix Strato 4-in-1 and Pixel Soldier TF-37X came joint first place on features and performance. Both have fast synchronisation and long range, and the Strato had an innovative pass-through hotshoe while the Soldier offered a handy wireless flash grouping feature. Ever competitive, Hong Kong-based manufacturers Pixel Enterprise and Phottix have seemingly played catch-up with each other on their technical specifications. The successor to the Strato, the Strato II Multi, has added in wireless flash grouping and a transmitter off switch – both functions found in the Soldier. In return, Pixel produced two new triggers – the Rook and the Bishop – to supersede the Soldier and add in the coveted TTL pass-through function. Now both companies have filled in the gaps, have we arrived at three perfectly equal flash triggers? Let’s find out. 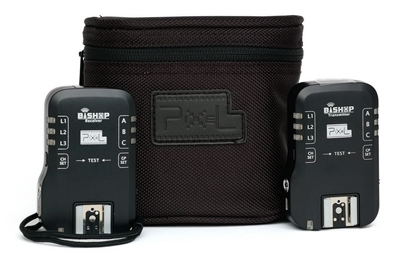 The Pixel Bishop was actually announced some time ago, but the first set of pre-production units we received had a bug preventing i-TTL pass-through from working properly in the Nikon versions. We fed this information back to the manufacturer who were able to fix the fault before the final model was produced. As well as being able to move diagonally as far as he likes, the Bishop is touted as one of Pixel’s flagship products with a whopping 500 metre operating range. With a nod to big brands, there is a mini-USB connector allowing users to update the firmware. There are three groups and seven channels. As a top-of-the-line product, the Bishop has a price tag to match, making it the most expensive system in this review. 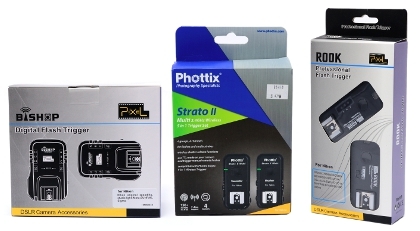 In response to rants that Chinese manufacturers produce too many incompatible triggers, Phottix made the Strato 4-in-1 replacement, the Strato II, backwards-compatible. 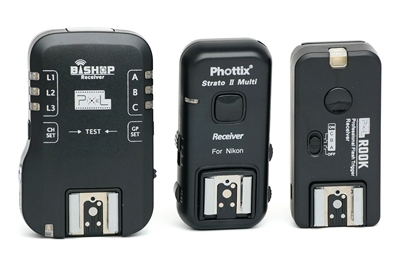 This means that a Phottix fans can trigger their old receivers with the new Multi transmitter. Since the old receivers don’t support groups, the receivers will fire irrespective of the group set on the transmitter, provided both units are set to the same channel. The new Strato II Multi has added four groups, a transmitter off switch and increased operating range (150m) since the original Strato. With these extra features, the new triggers are $15 more expensive, per kit, than the old ones. Effectively the direct successor to the Pixel Soldier, the Rook could also be described as a miniaturised version of the Pixel Bishop. 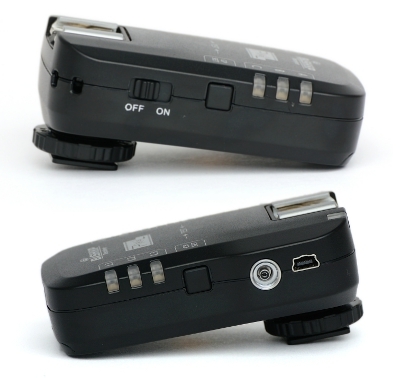 Both triggers have a TTL pass-through hotshoe and three wireless groups, but differ in size, connectors, batteries and range. The price difference between the Rook and Soldier is only around $15 per kit. What is the difference between channels and wireless flash grouping? Conventional channels in radio triggering work on a one-to-one relationship. Both transmitter and receiver have to be on exactly the same channel or their signals will not be compatible. e.g. if the receiver is set to channel 1 then it can only be triggered by a transmitter on channel 1. Thus, in a three-flash setup, one can switch individual lights in and out of the image without having to physically turn them off. And, unlike channels, one flash can appear in multiple different set-ups without changing its group. Pixel remotes have three channels with seven possible triggering combinations. The Strato II Multi has four channels and 15 combinations. 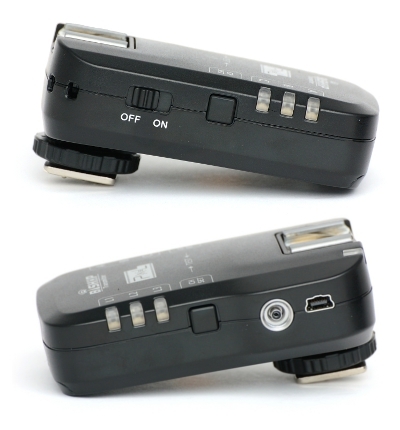 What is a TTL pass-through hotshoe? 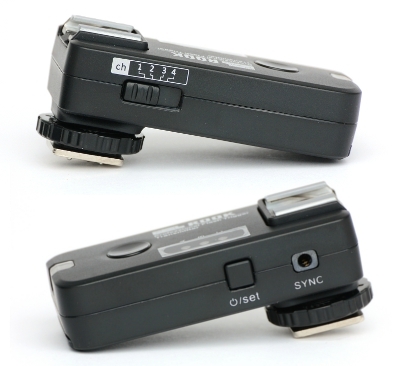 A TTL pass-through hotshoe is a hotshoe on top of the transmitter that emulates the one being occupied on the camera. The “pass-through” part means that all TTL information is passed through the transmitter as if it weren’t there. It allows you to use on-camera TTL flash, infrared masters and other accessories at the same time as radio transmitters without resorting to cables. Here’s a demonstration. 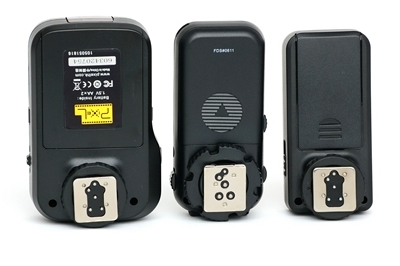 The Cactus V5, Yongnuo RF-603 and YN-04 II have hotshoes on their transmitters, but are not “TTL pass-through”. Any flash you put on top of the transmitter will only work in manual mode. All three systems will fire 100% of the time. Well, actually, the Pixel Bishop works more than 100% of the time – if you’re triggering a remote Nikon SB-600, that is. After you take a photo, it will sometimes autonomously pop an extra flash or two (just for good measure?). I haven’t been able to replicate this behaviour with my manual speedlights and studio lights, but that does not mean to say it won’t happen with other flash units. The Pixel Bishop was initially listed with a maximum range of 200 metres. Speaking with the manufacturers in Shanghai, they claimed the maximum distance is now 500 metres. Take this with a pinch of salt. Pixel claim the Rook will operate at distances up to 200 metres. The Strato II Multi is specified to work up to 150 metres. When I’ve completed a range test I will update this section. Using a full frame Nikon D700 with a focal plane shutter, all of the triggers synchronised successfully at 1/250 second, the maximum sync speed for that camera. At 1/320 second and faster, black bands will appear in photographs. The Nikon D40 uses an electronic shutter which, hard wired, can synchronise all the way up to the camera’s top shutter speed of 1/4000 second. 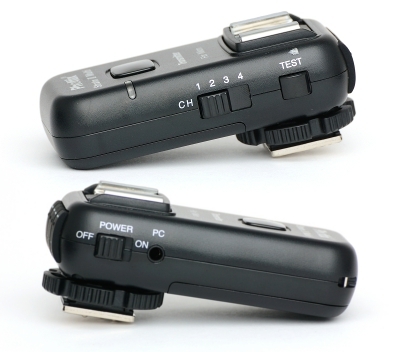 When using wireless flash triggers, slight delays in their circuitry mean that the top sync speed is a bit slower. With this camera, the Pixel Rook and Bishop can synchronise up to 1/1250 second and the Phottix Strato II can make 1/1000 second. How does this compare with other triggers on the market? Consult the graph below. These triggers are the only ones on the market, besides the unreleased Ojecoco H-550, that offer full electronic pass-through on the transmitter. The transmitter hotshoe on the Strato II works perfectly, whether the device is switched on or off. The same goes for the Rook. When the Bishop transmitter is switched off, TTL pass-through goes a bit haywire. If the flash on top is in manual mode then it won’t fire, and if it’s in TTL mode then it will fire a preflash but not an “actual” flash. So what’s wrong with the Bishops? When we first tested out pre-production samples, the Bishops’ TTL pass-through didn’t work properly either (though the bugs were different). These problems only seem to affect the Nikon version, but will be a massive deal breaker for anyone considering the Bishop F-510 system. Certainly Pixel know how to get this working, since the Rook operates without issue. Maybe I’ve been unlucky and simply got dud copies both times. Would you like to take that chance? First let’s have a look at how the transmitters of each system compare. On the front of their transmitters, the Strato II and Pixel Rook have prominent “Test” buttons. You can press the button half-way to wake up sleeping flashes and autofocus remote cameras before pressing down all of the way to fire. To test a Bishop, there isn’t a dedicated button so you have to press the Channel and Group buttons simultaneously. There will be a one-second delay between tapping the buttons and firing, which gives you time to look up at your flashes. While this might seem a bit awkward, it comes fairly naturally in practice. 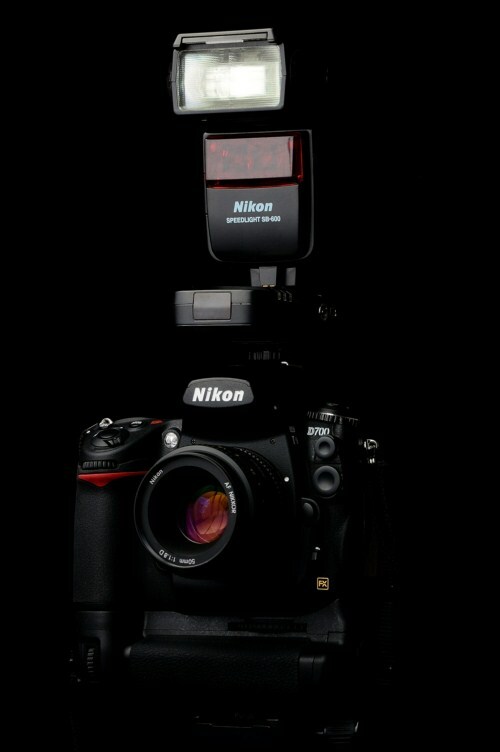 All three transmitters have full Nikon i-TTL hotshoes including a socket for locking pins. You can put a TTL speedlight on here for some on-axis fill or bounce flash, or even run a commander unit and optically trigger some AWL slaves in parallel with your manual radio system. The Bishop takes AAs and is significantly bigger than the other two triggers as a result. One of the main complaints about the Bishop is the door to its battery compartment isn’t secure enough. It can fly off at the slightest push, even when mounted on your camera. The battery doors on the Strato and Rook cause no worries and take smaller AAA batteries. While all three transmitters have screw-down hotshoe feet complete with locking pins, the Strato Multi II’s is larger and easier to grip than the piddly Pixel ones. The Bishop transmitter displays its channels on one side and groups on the other. The channels, labelled L1, L2 and L3 are actually in binary, providing seven in total. There are three groups: A, B and C, but you can trigger seven different combinations of them. Cycle through group combinations or channel selections by tapping the adjacent buttons. By default the LED indicators are switched off, but will illuminate when you tap the associated button. Along the sides of the Bishop you will also find a power switch, a lanyard hole, a Prontor/Compur (PC) input and a mini-USB port. The mini-USB port – as well as providing firmware updates – actually allows you to power your Bishop from any 5V power source. You can run your triggers from the side of your laptop, a battery pack or a mobile phone charger! The edges of the Strato Multi are more rounded and sleeker than the Bishop. You’ll find the power switch, another test button on the side, along with a simple channel switch which doesn’t require knowledge of binary. There is an input “PC” port but it’s actually a 3.5mm audio type connector, not a Prontor/Compur socket. On the back of the transmitter are the buttons for controlling the four groups A, B, C and D. Press one to switch that group on and its LED with illuminate. Press it again to switch it off. Interestingly, it is possible to select no groups at all, whereas on the Bishop and Rook you must trigger at least one group. The indicators show up well even in bright light, though in my opinion the buttons are a tad “mushy” to the touch. Because it’s at the back of the transmitter, not on top, you don’t need to take your camera away from your eye to check your wireless flash grouping. On the other hand, try not to mash the buttons with your nose or forehead or you’ll mess up your lighting configuration. The Pixel Rook is to the Strato II what the iPhone 4 was to the 3Gs: a boxier shape yet in contemporary style. Annoyingly for some users and inconsequentially for others, there is no provision for a lanyard on the Rook. If straps are a must, try the Strato II or Bishop. Like the Strato, there are four channels on a simple switch – no binary necessary. Unlike both the other triggers, however, there is no power switch. Instead you must hold down the “Power/Set” button to switch the device on and off. Tapping it briefly will cycle through the selected groups, which are displayed on top. Unfortunately if you go too far, you have to cycle through the entire seven combinations again. The Strato’s group selection is less fiddly. Now let’s compare the receivers. 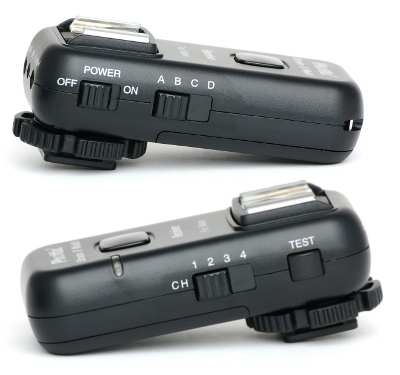 Though none of these systems is transceiver based, the pass-through hotshoe on the transmitter can make the receivers and transmitters almost indistinguishable. From the front, the only major difference is that the Rook uses a physical switch to choose its group. All three receivers take the same batteries as their transmitters. The coldshoe feet are plastic with a metal 1/4″ tripod socket and similar locking rings to the transmitters. Spot the difference! The Bishop receiver is identical to the transmitter. The Prontor/Compur port is now an output, used both for flash triggering and remote shutter releases. Unfortunately, since a PC socket only has two contacts, there is no autofocus support for remote cameras. On the plus side, you can power the Bishop receiver via USB! 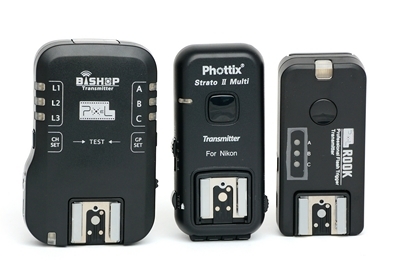 The Phottix Strato II Multi receiver may also be powered by an external 5V DC source, but the socket is different, resembling more of a Nokia mobile phone connector. 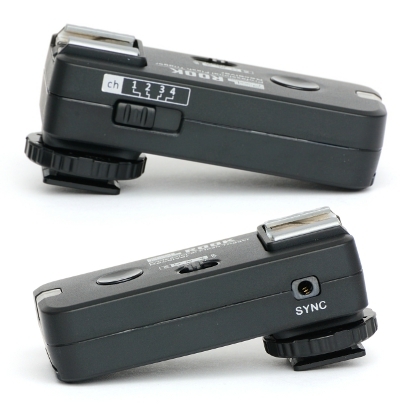 This, the 3.5mm flash sync output and 2.5mm shutter release output, are found on the end of the receiver. Select which group you want your receiver to be in with a simple switch on the side. A unique feature of the Strato II (though maybe not that useful of one) is the ability of the receiver to be used as a wired shutter release cable. Simply plug it into your camera and use the large black test button. You wouldn’t always need this, but it could come in handy in certain situations. The Rook receiver is relatively clean compared to the jam-packed Strato II. You’ll find a channel switch and a 2.5mm sync output. The largest of these triggers, the Bishop can’t just fit into nooks and crannies in your camera bag like the minuscule Rook and Strato II. On the other hand, the Bishops come in a superb carrying case as standard. 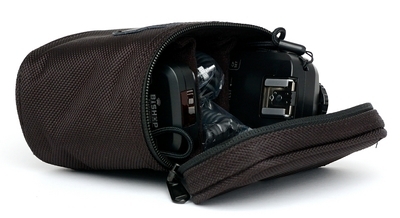 It’s durable and padded with three sections – enough to hold two Bishop units and a bundle of cables, or three units together. The Bishops also come with a tabletop flash stand and some thick lanyards. The Stratos come with lanyards. The Rooks don’t come with any accessories besides connecting cables. The Strato Multi is backwards-compatible with the Strato 4-in-1, which in principle is good, but only really worthwhile to existing Strato owners. I can’t see why anybody would buy the Strato over the Strato II for the sake of saving $15. The Pixel Rook and Bishop aren’t compatible with each other, or anything else, which is a bit frustrating. However, there are other parts of their product line which are inter-compatible, such as the King and Opas. Additionally, the pass-through hotshoe means you can stack transmitters to use them together. Different dedicated units within one product line will work together. 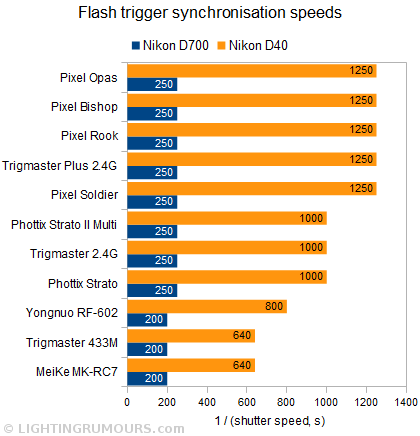 In other words, a Strato II for Nikon will trigger a Strato II for Canon, even waking up flashes from sleep mode. The same goes for CaNikon Bishops and Rooks. One ace that Pixel has up its sleeve is that the company provides for a wide range of cameras – not just Canon and Nikon. You’ll soon be seeing Bishops for Sony, Olympus and Panasonic and, similarly, Rooks with iIso and Four Thirds shoes. Were these three triggers born equal? Yes and no. Their overall price and feature sets are largely similar, but the devil is in the details. The Rooks are the cheapest by a narrow margin for a basic 1TX/1RX set, but you make substantial savings as you include more and more receivers in your kit. A four-receiver kit is just $176 – saving you $64 over buying receivers individually. The other two triggers don’t seem to offer such quantity discounts. If you need a lot of receivers and are on a budget then the Rooks could be the way forward. For photographers making full use of wireless flash grouping in different lighting configurations, the Strato II Multi is the logical choice. There are four groups providing fifteen different flash combinations. In a mains studio environment you can power the Stratos by an external source so as not to worry about batteries. Lanyards are included to reduce cable strain when triggering studio lights. Another segment who might be interested in the Strato IIs are landscape, product or nature photographers, as you can use a receiver as a wired remote. As for the Bishops, are they worth the extra dosh? Taking AAs, the Bishops could be an easy choice for those photographers who want to interchange batteries between their triggers and their speedlights. There are other nice touches like the included carrying case, and clear, bright indicator lights. Nevertheless, I can’t recommend the Pixel Bishops as I’ve encountered too many problems using them with a Nikon SB-600. However, the Canon version doesn’t appear to have the same issues. 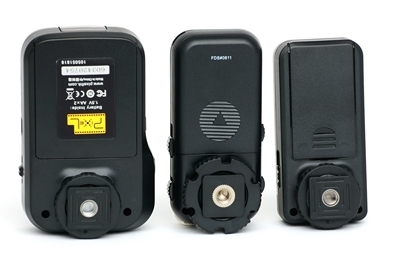 The Pixel Rook and the Phottix Strato II Multi both work well for TTL pass-through and wireless flash grouping. The Strato II has more functions and is a little bit easier to use, but the Rook is cheaper if you need large numbers of receivers. The Pixel Bishop seems overpriced and the Nikon version has too many bugs for a product that’s already gone to market. A Pixel Rook kit including a transmitter and one receiver costs $90. Though you can buy individual receivers for around $50, it is much better value to buy a kit with multiple receivers included. Two, three and four receiver kits cost you around $116, $146 and $176 respectively. You can get a set of Strato II Multis directly from the manufacturer for $98. Individual receivers are $47. The triggers are also available for a little bit more on eBay and from local Phottix dealers. Bishops (also named “F-510” in some markets) come in kits for $120. The price is $85 for extra Bishop receivers.